A rathaus is a town hall. 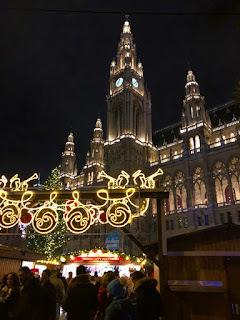 The old Vienna Rathaus has one of the most spectacular Christmas Markets in the city. 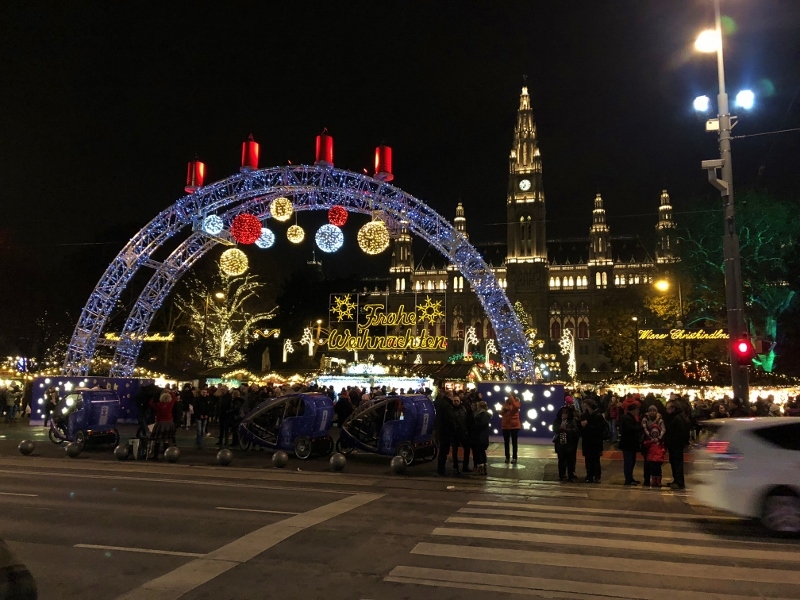 We took the subway to the Rathaus and arrived in time for dinner. 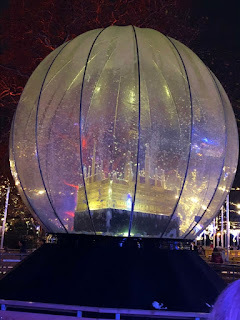 The Christmas Markets have food but we were looking for a place out of the cold where we could sit down and eat. Surrounding the Rathaus are a lot of theaters and as we looked across the street the guys saw a sign that said restaurant and we headed for it. We didn't know at the time that it was one of the nicest restaurants in Vienna, Das Landtmann. We were pleased to find white tablecloths and crystal chandeliers. The food was delicious including the goulash that the guys indulged in. 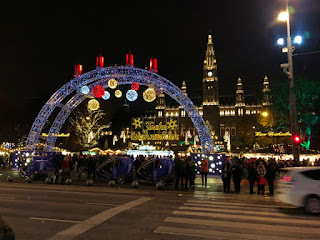 After dinner we crossed the street once again and entered the Christmas Market. It was full of people truly enjoying themselves as they indulged in holiday treats, punch and activities like ice skating and a few amusement rides. 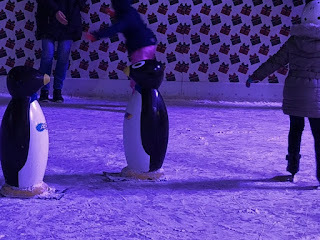 The ice skating rink included a smaller one for learners and little ones who are just getting started. 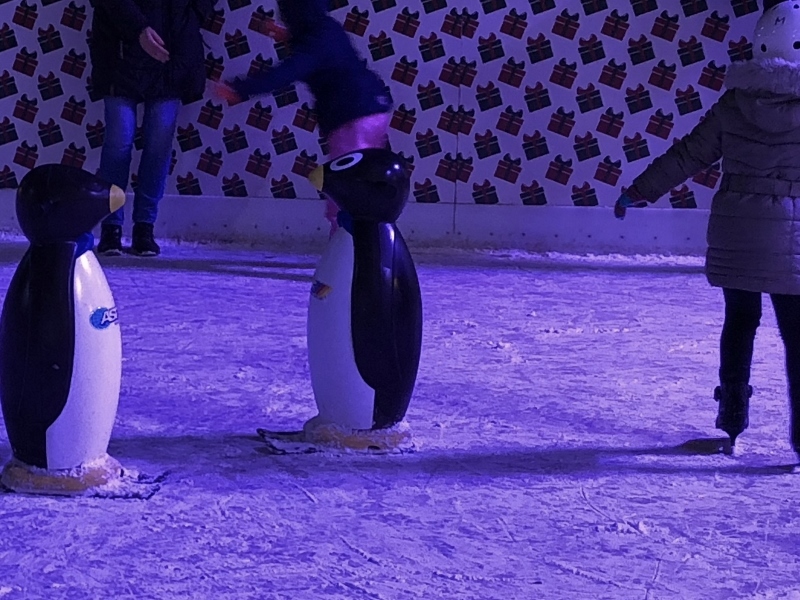 They had darling little penguins with handles on the backs of them that the learners could hold on to and skate around without the danger of falling. Strolling around the market we saw a lot of the same merchandise with the occasional more interesting creations. One of them sold paper stars that folded flat and then extended to a three dimensional star with designs cut into them. 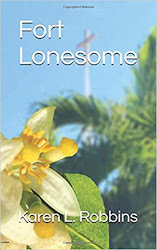 They were illuminated from within by a small light. This market was definitely more decorated than the others we'd visited and included a lighted giant snow globe. I didn't think the mugs they were serving punch in were as clever as the Christmas boots at St. Stephen's. There were some giant soft pretzels that looked tempting but dinner had filled me up and I'd already had a big pretzel at another market--so good! 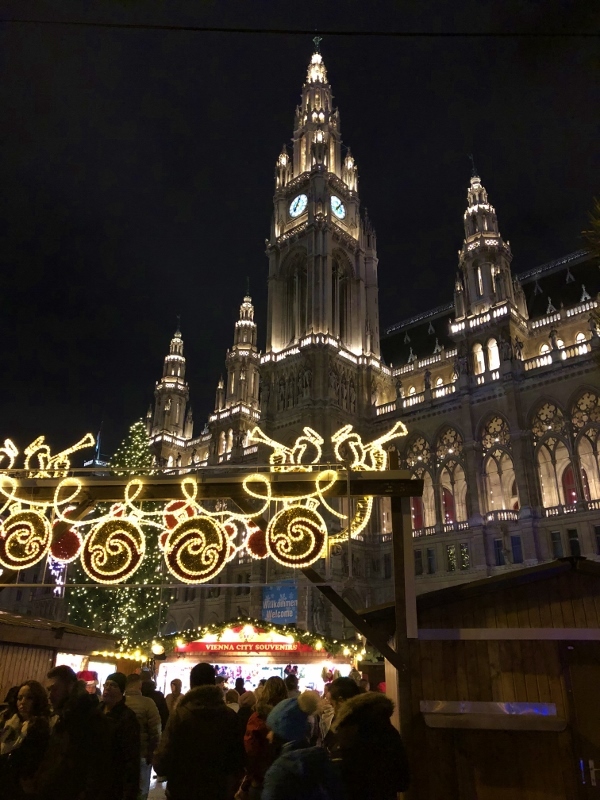 At night the Rathaus which dates back to the late 1800s, is nicely illuminated and made a beautiful backdrop to the Christmas Market. During the day you can tour the town hall but we never made it back to do that. You have to save some things for a second visit.